The difficulties with denying guns to those on the no-fly list. Why denying guns to those on the no-fly list is more complicated than it seems. 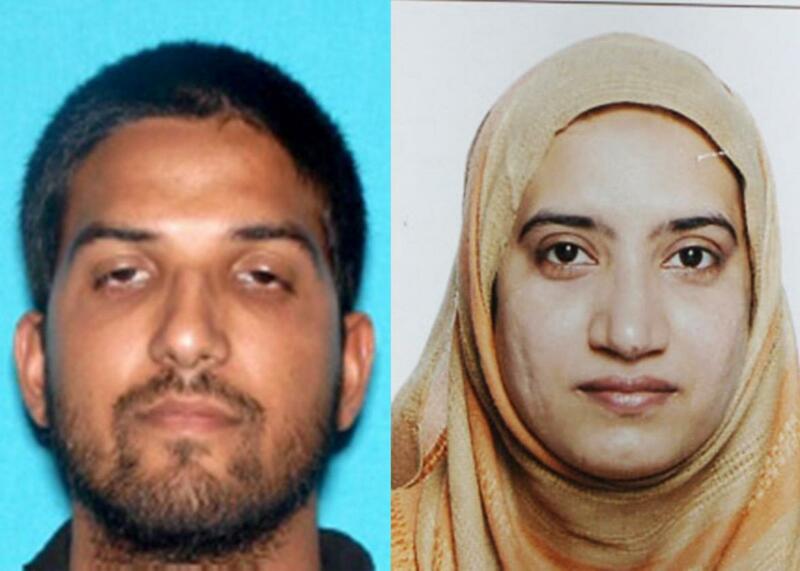 Syed Rizwan Farook and Tashfeen Malik. In his speech Sunday night on the San Bernardino killings, President Obama called on Congress “to make sure no one on a no-fly list is able to buy a gun.” The logic seems impeccable. The no-fly list contains the names of suspected terrorists who are not allowed to travel on airplanes. As Obama earlier said, “If you’re too dangerous to board a plane, you’re too dangerous, by definition, to buy a gun.” Yet Republicans have already rejected a proposal by Sen. Dianne Feinstein based on just this logic. Has gun-rights nuttiness run amok? Or do the Republicans have a point? The answer is more complicated than it might appear. The no-fly list has drawn the complaints of civil libertarians since it was established after the Sept. 11 attacks. The list contains the names of people who the government thinks are a threat to civil aviation—terrorists. The government constantly updates the list and sends the names on it to airlines. These people are denied passage, often left stranded in some foreign country until they undertake the arduous process of seeking help from the local U.S. embassy. For all practical purposes, they cannot travel by air. Yet the government does not have proof that these people have committed crimes nor, since it can’t see into the future, that they will commit crimes. Thus, the no-fly list seems to violate the presumption that people are innocent until proven guilty. The ACLU sued the government for just this reason. It represented several American citizens and resident aliens who had been denied passage, including four military veterans. In 2014, a federal court ruled that the no-fly list violated the due process rights of the plaintiffs. Applying the rule in a Supreme Court case called Mathews v. Eldridge, the court argued that the no-fly program impinged a significant constitutional right—the right to travel. (No, it isn’t in the text of the Constitution, but it has been recognized for decades.) The interference with the right by itself was not fatal because the government’s interest—in preventing another Sept. 11–style hijacking—could hardly be stronger. But the court felt that the government supplied inadequate procedures for contesting one’s inclusion on the list. While the government allowed a person to complain, it did not give him the reasons for why he was on the list. The government might determine that a person’s name was incorrectly on the list—as happened to Sen. Ted Kennedy, whose name was the same as an alias used by a suspected terrorist—and remove it. But if it does not, it provides no way for the listed person to challenge the evidence used to declare him a threat. While the court ruled in favor of the plaintiffs, it did not end the program. It ruled that the government must supply adequate notice about its reasons for placing people on the no-fly list, so they could contest the decision. The government now provides people on the list with more information than before, but the ACLU is still unsatisfied: “[T]he government still keeps its full reasons secret. It also withholds evidence and exculpatory information from our clients and refuses to give them a live hearing to establish their credibility or cross-examine witnesses.” No one knows the number of names on the list because the list is classified. Republicans were never concerned about the no-fly list, which they saw as a serious effort to combat international terrorism, but they are exercised now that the right to bear arms is at stake. On the other hand, it seems unlikely that civil libertarians who criticized the no-fly lists will be terribly upset about Obama’s initiative. The ACLU doesn’t agree with the Supreme Court’s ruling that the Second Amendment gives an individual the right to own guns and does not go to court to protect that right. It’s easy to accuse both sides of hypocrisy, but the reality is more interesting—and depressing. Conservatives and liberals are polarizing about civil liberties, just as they are about everything else. For conservatives, civil liberties mean gun rights, speech rights, and rights to religious liberty (except perhaps for Muslims). For liberals, the focus is on protections from unfair trials and from racial and religious discrimination, and on privacy. The reactions to San Bernardino illustrate this divide. Republicans argue that the right response is to increase surveillance of Muslims, the Democrats argue that we should strengthen gun control. The two sides are using the tragedy to advance their ideological positions rather than reach a reasonable compromise, one that would most likely include incremental restrictions on gun rights and enhanced surveillance of suspected extremists. Obama concluded his speech by appealing to “our common ideals as one nation and one people.” ISIS probably knows little about the ideological divisions in the United States. But if it really inspired the San Bernardino killers, it could hardly have been more effective at showing the emptiness of Obama’s appeal. Read more of Slate’s coverage of the San Bernardino, California, shooting.